A little over three months after WDW opened, an "All in the Family" television episode mentioned the Country Bear Jamboree. The usually cheerful Edith is going through menopause, which has played havoc with her moods and made her grouchy and unpredictable. Archie, in an attempt to make her feel better, entices her with talk of an upcoming trip to WDW sponsored by his union (I think it was his union--remember those?). 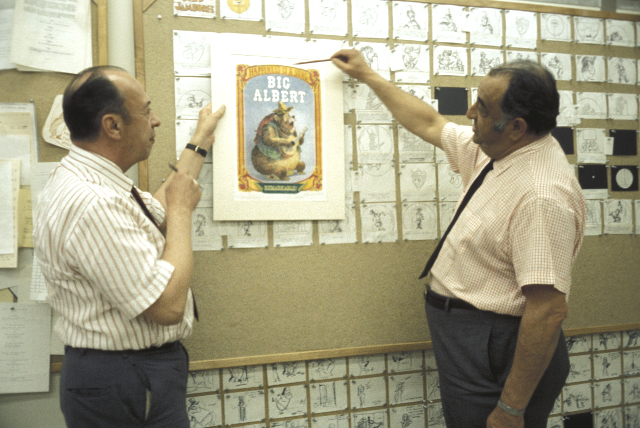 He has one of the original WDW promotional booklets, and he tells Edith that there is a "bear band." 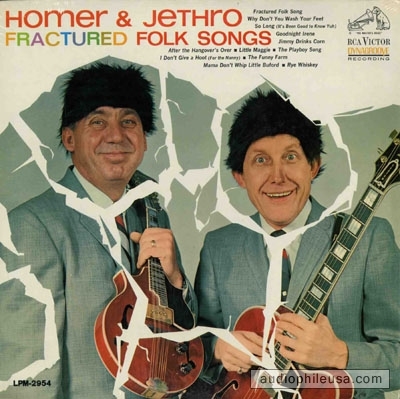 Edith gets a horrified look and angrily says, "They've got a naked band?!" He then explains that it's a "bear" band, not a "bare" band and shows her the picture. She still won't have it, and says she hates bears. On a separate note, I don't ever recall, as a child from a small-town, rural, country-music-listening background (think Mayberry, NC), ever feeling that the Country Bears were in any way mocking or belittling me or the world I lived in. If anything, it seemed like a very positive affirmation of the American musical tradition that was so much a part of our life. I'd venture to say that we saw it as a positive (and hilarious--and I now know subtly brilliant and nuanced) experience. 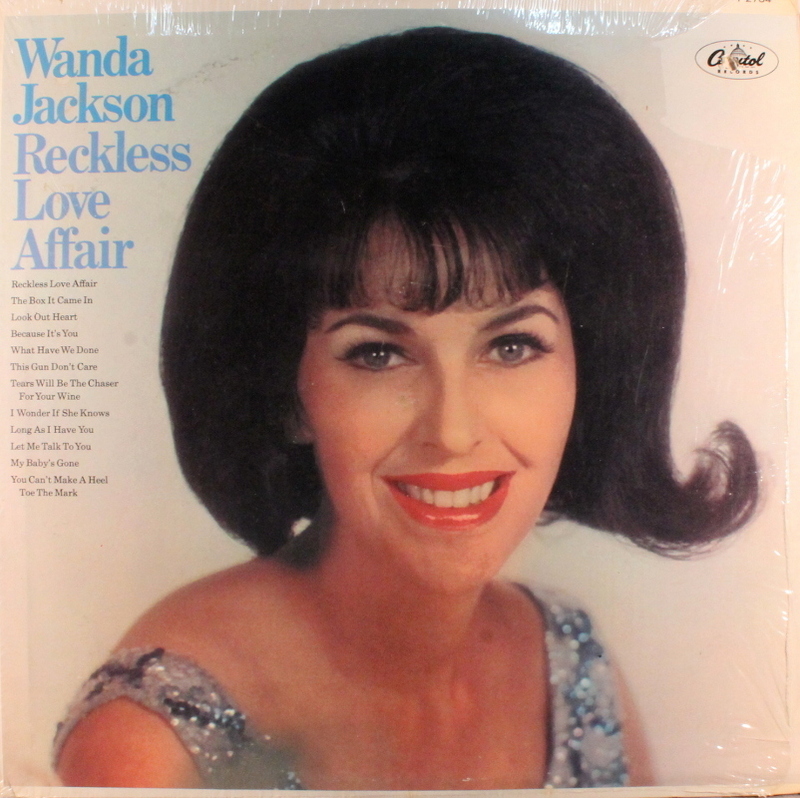 I had the record album and booklet and knew all the songs by heart (in fact, I still do!). I expect the people who thought (or think) it to be mean-spirited towards rural Americas probably live in a big city. One big realization for me: am I the only one who thought "Little Buford" was a dog? 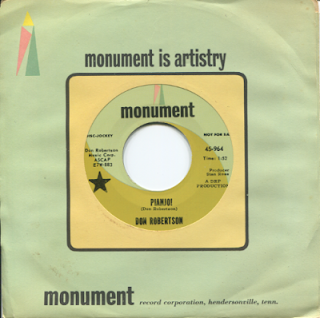 (See the little dog pictured in the mural in the background of this clip: http://www.youtube.com/watch?v=IYbHvAPoIkg) The extended lyrics make it's clear he's not. Personally, I'd say that American Sings is the zenith of the Disney park theatrical experience. It's a cut above Country Bear Jamboree for me, but maybe I'm just being nostalgic. Reading this article makes me see even more clearly the connective tissue between the two shows, though, celebrating the music that these imagineers grew up with. America Sings went a step further to separate "Country" and "Western" into two rooms, just to underscore the differences. Both these shows were so extravagant that it amazes me that only three years passed between them. And looking back I find it immensely weird that they built both of them in Anaheim. In the same year, no less. The Disney of today would have just cloned CBJ and called it good. 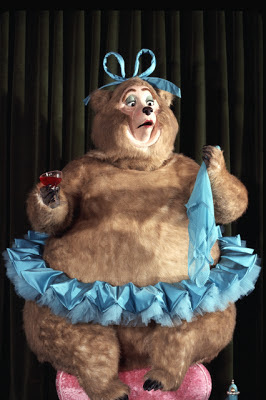 Or at the most, built America Sings as their west-coast animatronic spectacular and kept the bears exclusive to Orlando. Did I actually say the two opened the same year at Disneyland? I need to blow out the dust between my ears. '72 and '74 are not the same year. Still really dang close for two shows that are so thematically similar. seriously, I love the show, had vinyl from a WDW trip in late 1981 (and since then have the 'side one' from the Disneyland super 6-disc set). I've long been known for complaining about the state of 'country' music today, in this lite-rock form its had for the last couple of decades, because the 'western' and the folk-blues from this show is precisely the 'country' I was introduced to when I lived in Florida in the 70s. Even the crossover country of the early 80s was tolerable compared to most of what's out today. Hee Haw back then had more going for it than the polished stuff of today, where the stars look richer than rap gangs. I knew Buford wasn't the dog. Based on my own experience and that of my peers, I understood exactly what was going on in this scenic backdrop. The little dog is staring at a woodshed. The action is taking place offstage, so to speak. The woodshed was the place where boys were traditionally taken to be spanked, whipped, paddled, whupped . . . take your choice of terms. We didn't have an actual woodshed at my house (just a woodpile), but the metaphor of being taken to the woodshed remained in common usage for any spanking or threat of a spanking, especially a severe one. I've read your blog for a few years now, and being a huge Disney World fan since it's inception I'm again in awe. Great job researching all this. I can't wait for the second installment. Well done, very very well done. Remarkable job as usual, Foxxy. The standard around here continues to stack higher with every post. The evolution and definition of "Country" here is what's most intriguing, as it truly came to be known as a fusion of the genres listed. The current-day mutation of that music is a wispy phantom of the basis you detailed. 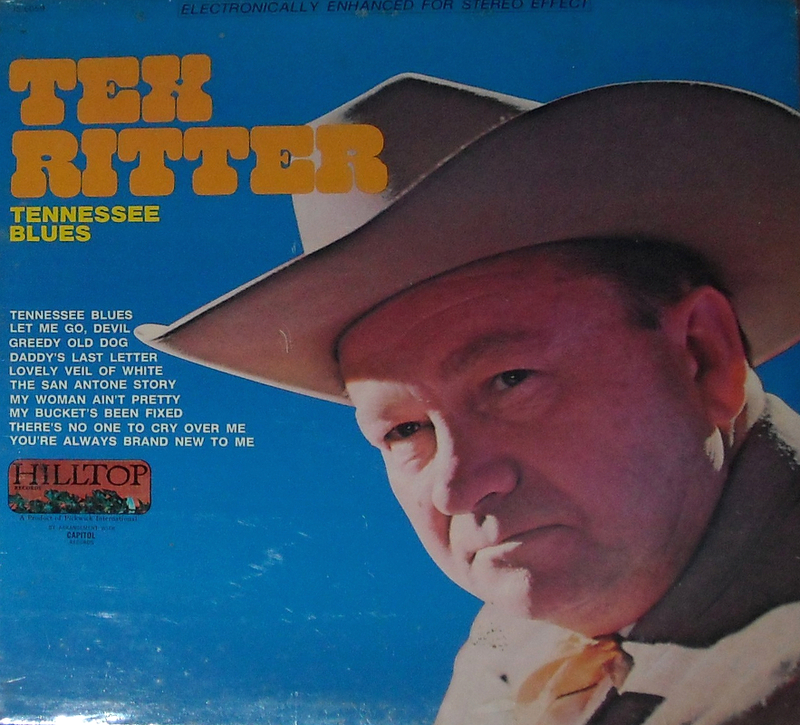 Country has become so intertwined with Pop music today, that even the stars of the Country charts more closely mirror the bratty/self-entitled Top 40 stars than the humble folk crooners of the past. 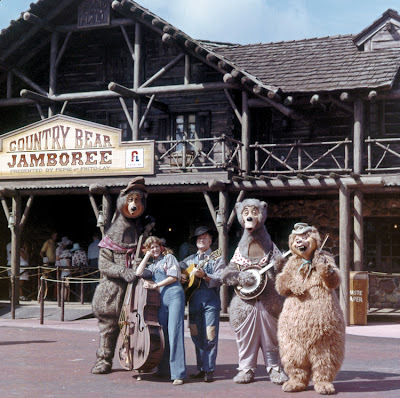 The comparison between Country Bear Jamboree and America Sings is an interesting one. 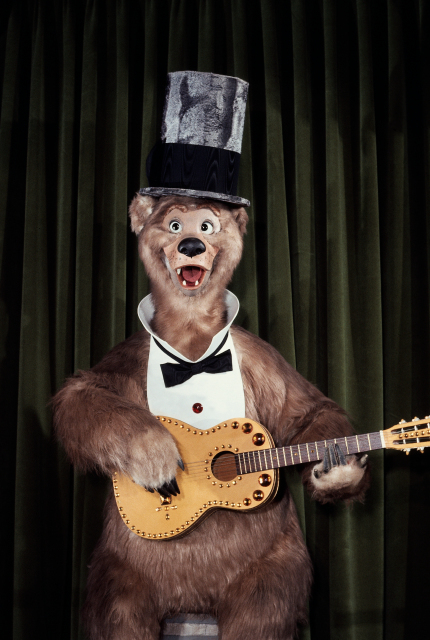 The novelty of the rotating stage aside, a lack of recurring strong, personality-driven characters in America Sings places it slightly below the Bears. "Sings" presented an ambitious premise, which worked fairly well, but the original "Jamboree" show was much more cohesive and kept within its shape. Thanks so much for putting this together, looking forward to Part II! One thing that shouldn't be overlooked is that Marc Davis LOVED the Country - Western variety show Hee-Haw. That show was very very popular during the late 60's and 70's. In fact musical variety shows were probably an influence on how the final show came together. The Mineral King Lodge show was to be themed inside, but the concepts for Walt Disney World --as late as 1968 show the BEAR BAND performing along a hill with fountains and boulders facing a Frontierland restaurant's outdoor seating area. At various times waterfalls would "curtain" open revealing a group of bears performing some musical number -- along the same mountain a cluster of boulders would open presenting another cluster of bears -- and very few were even country western. Some were a French quartet, a Marching Band, a Roaring 20's Jazz Band etc....Sam Mckim did most of the artwork for these versions , but feature the costume bears Marc had designed. Dorothea Redmond came up with concepts of a giant bear den/cave that the bears had done up the interior to look like a 1880's music hall. Finally with the decisions to save all the rock work for phase two and Thunder Mesa, The BEAR BAND JUBILEE gets a corner saloon like structure then is refined to the Grizzly Hall structure with the show that opened in 1971 as Country Bear Jamboree. A Disneyland expansion document book of 1971 proposes one of three Walt Disney World attractions to be constructed at Disneyland for a 1972-1973 opening, Space Mountain, Mickey Mouse Revue or Country Bear Jamboree. The Bear band show was selected hands down after how popular the show turned out. Can't wait for the rest of this series. This is great! I've always wondered who "did" the Country Bears. 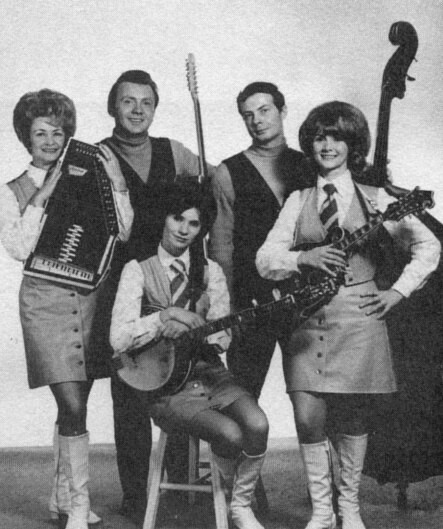 Happy to know it is The Stonemans, who are a somewhat local group for me. I'm in Northeast Tennessee and grew up in Southwest Virginia. 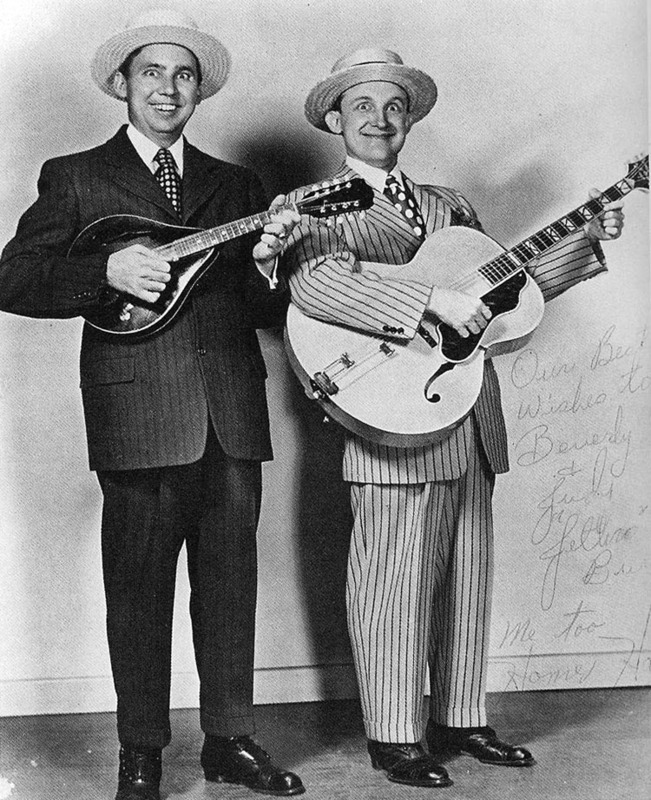 Their dad, Pop Stoneman, is credited with helping Ralph Peer launch what we know as country music today with their Bristol (Tenn.) recording sessions in 1927 (The Carter Family came and recorded there, and that's how they were discovered). Anyway, great work, well done on this history! Come up this way sometime and I'll take you to hear some great hillbilly music.